White short-sleeved shirt, with striped shadow pattern on front; each stripe split into five lighter stripes. Remainder of shirt, excluding sleeves, consists of very thin shadow stripes. Navy blue winged collar, edged with thin turquoise stripe and adjacent slightly thicker white stripe. Small turquoise inserts on either side of neck, edged with a thin white stripe. Large navy blue v-shape beneath neck, split on right-hand side by white stripe continuing from left, underneath turquoise insert. Embroidered emblem, with white margin, in centre of chest, with 'UMBRO' in large capitalised navy blue lettering above it. Black number on reverse in the same font as previous England shirts, except with a turquoise border. Navy blue shorts, with white drawstring. Large triangle at base of seams, bottom third of which is a smaller turquoise triangle and the remainder, white. 'UMBRO' in capitalised white lettering on left thigh. Embroidered emblem on right thigh. White socks. Sets of two concentric navy blue diamonds across tops, edged with two turquoise hoops. A long-sleeved version of the shirt was also worn. The cuffs were navy blue, with a thin turquoise stripe near the edge. For the games against Colombia and Norway, the number on the back of the shirt was plain navy blue, without a border. For the last six games in which the shirt was worn, a black number, with a turquoise border, was worn in the centre of the chest, beneath the emblem, in the same font as on the reverse of the shirt. For the four games in the 1996 European Championship final tournament, the player's surname was printed in capitalised black lettering, with a turquoise border, above the number on the reverse of the shirt. Gary Neville's shirt also included his first initial i.e. G. NEVILLE. With the exception of the game with the Netherlands, England had logos sewn-on to the upper sleeves for the 1996 European Championship fixtures. The 'Euro '96' tournament logo was on the right arm and the UEFA Fair Play logo was on the left arm. 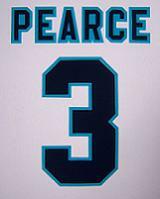 A white number, with a turquoise border, in the same font as on the shirt, was worn on the right thigh of the shorts, above the emblem, for the last six games in which the uniform was worn. For the last six games in which the kit was worn, the diamonds on the socks were smaller and the turquoise hoops rose at the top when in-line with a diamond. 40 players made at least one appearance in this shirt. 16 of them won their first cap in the shirt, an average of one for each match. This was the first England shirt worn by David Beckham, who went on to become his country's most capped outfield player, with 115 appearances. Gary Neville went on to win 85 caps and Sol Campbell notched up 73 international appearances. For nine players, this shirt was the last that they wore at international level. These included John Barnes winning his 79th cap, Peter Beardsley's 59th and Mark Wright's 45th. David Unsworth won his one and only cap against Japan in this shirt. Shearer's goals were all scored at Wembley and five of them made him top scorer at the 1996 European Championship final tournament. Sheringham scored his first England goal in this shirt (as did Nick Barmby and Steve Stone) before going on to net eleven. David Platt's 27th and last England goal was scored in this shirt. 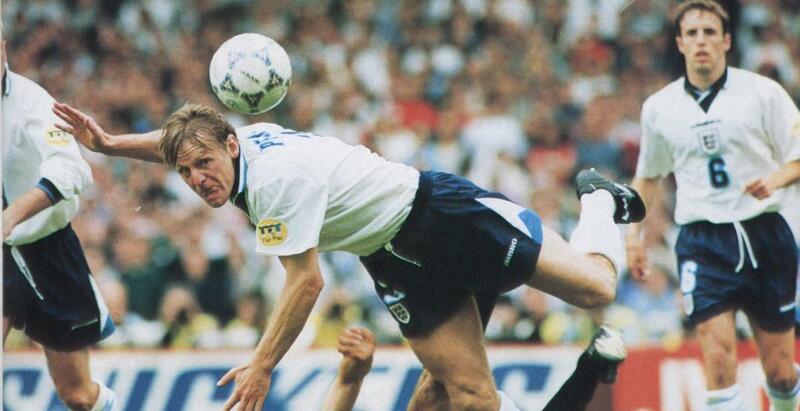 Stuart Pearce and Stone also scored their last international goals in it. As Platt's international career came to an end, he relinquished the captaincy to Adams, who led the team out at Euro '96. When Glenn Hoddle took over as coach, he handed the role to Shearer. England sported this generally attractive Umbro shirt--unusual because of the absence of red from all but the three-lions emblem--in their first four matches at the European Championship finals in 1996, all but the semi-final match against Germany which led to their elimination on penalty kicks. For the first time, the three-lions emblem appeared in the middle of the shirt instead of on its left side. Also for the first time, the manufacturer's name appeared on the jersey in large capitalised letters, above the three-lions emblem, and an observer new to football might well have concluded that it was the Umbro team's shirt. On previous jerseys, the name had first been confined to tiny letters under the company's diamond insignia, which appeared only inside the neckband on this shirt. Following a succession of friendly games in preparation for Euro '96, England hosted the tournament with numbers on their chests for the first time since Euro '92 and logos were sewn onto the upper outer arms of the shirt. Strangely enough for the host nation though, neither logo was worn in the famous 4-1 victory against Netherlands, at Wembley. It was a hugely successful tournament for England, who finally succumbed in the semi-finals which saw the end of Terry Venables' brief two-year reign as coach. The opening match of the following season not only saw the beginning of Glenn Hoddle's tenure, but it was also the birth of the international career of David Beckham, the first player to win 100 caps entirely in Umbro. All of the previous centurions had worn other kit manufacturers' sportswear. Billy Wright had worn St. Blaize and Hope Brothers outfits, before Umbro began to supply the majority of shirts for the national team. Sir Bobby Charlton and Bobby Moore both wore Bukta kits in the early 1960s and Peter Shilton sported Admiral colours throughout the middle part of his international career. Beckham wore 15 different Umbro shirt designs for England.